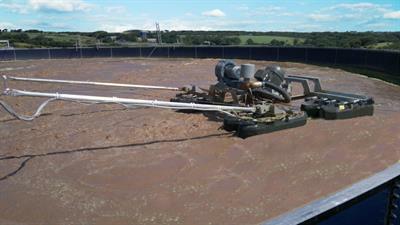 Municipal and industrial aerobic digesters are an ideal application for the Aire-O2 Triton process aerator/mixer. The surface-mounted, minimal maintenance Triton provides superior aeration and mixing in solids of up to 4% and depths to 33ft (10m). Aeration Industries’ Aerobic Digester solution offers substantial capital and operational savings, as well as improved process flexibility. Multiple mounting options are available to best fit your needs. Aire-O2 upgrades and retrofits lower installation and maintenance costs by eliminating diffusers & associated air piping, blowers, blower buildings, enclosures and independent mixers. Separating aeration and mixing by cycling the unit’s blower on and off allows for process control and flexibility. Equipment is also accessible from the top of the basin for easy maintenance without draining the tank. Traditional aerobic digesters require labor-intensive maintenance. Nobody wants to drain their tank to access the submerged components or remove the sludge. The surface-mounted Triton is easily accessed at the surface and prevents sludge buildup on the bottom of the tank. The Aire-O2 Triton gives you the benefit of fine bubble aeration for high oxygen transfer without the hassle of traditional air diffused systems. No reviews were found for Aerobic Digester Aeration. Be the first to review!